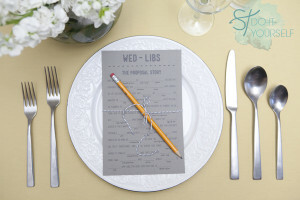 If you’re a fan of the spontaneous and fun, then don’t forget to include mad libs in your wedding planner. 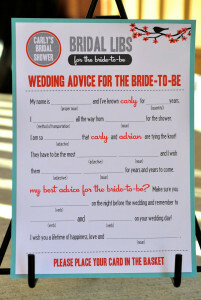 Mad Libs are usually pages with blanks that can be filled out on the spur of the moment to be added to your wedding. 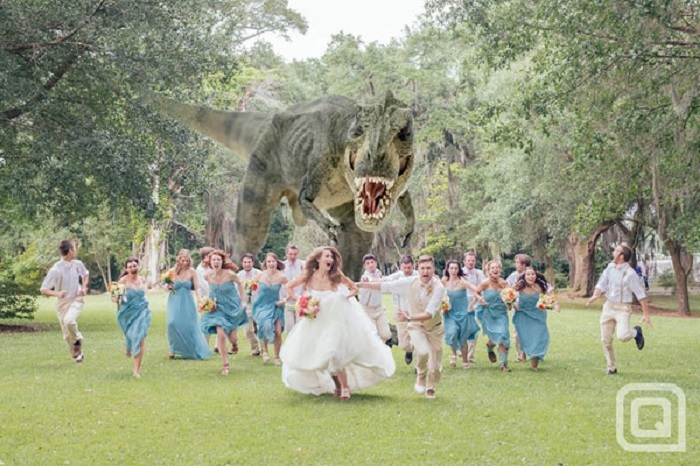 Depending on how brave you are, they can be worked in almost anywhere, from your wedding invitations, to your vows! Here are some of the most fun wedding mad libs you can try out or consider. 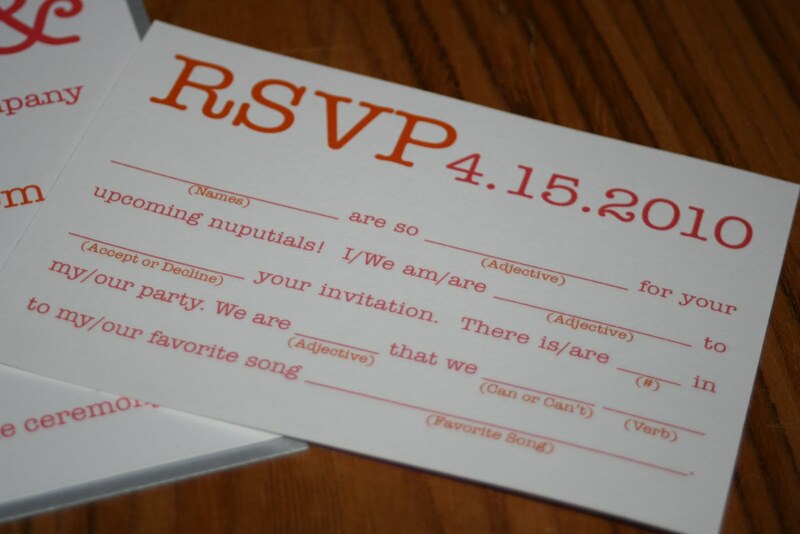 Probably one of the easiest ways to insert mad libs into your wedding is to use them in the invitations. 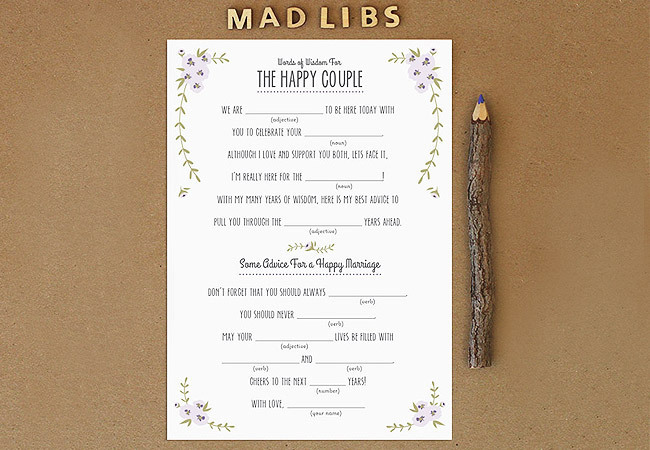 In this way, all you have to do is print out as many of the same mad lib as you need and then customize it by filling it in with colorful markers or pens, or leaving it blank as the occasion calls for. Remember to include a mad lib RSVP card if you go this route. Be creative, remember to leave plenty of room for names (or suggest that people sign their initials) and remember to have fun. A lot of people choose to send out food cards to see who can eat what and who is allergic to what, before their wedding. Food mad libs are a great way to go because you can make this boring task a lot more fun. Putting out cards with blank spaces for what they don’t eat (and plenty of humor as well) and you can have a little bit of fun finding out what people don’t eat. Most people collect their RSVPs and save them in the guest book, so you can make each one unique by making it a mad lib. 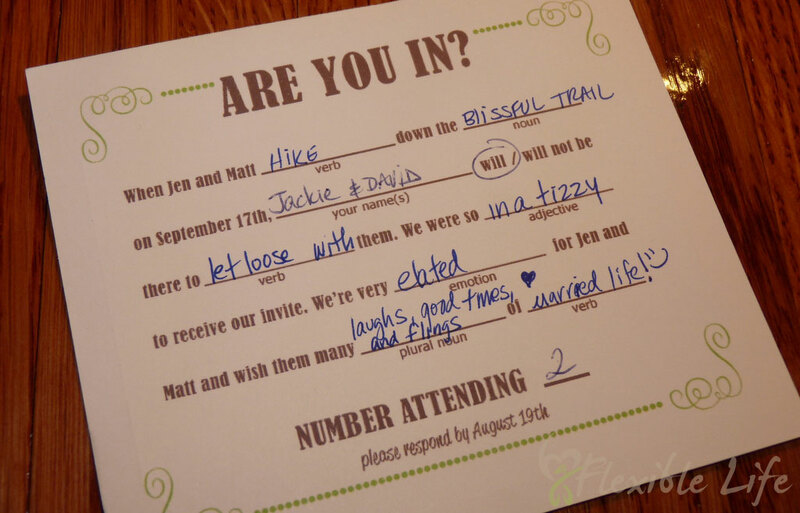 Remember to include specific details that they will have to mention (such as shoe size if you’re taking everyone bowling), your names, the wedding date, and anything else you can think of. Mad lib games make great entertainment so feel free to have a blast. 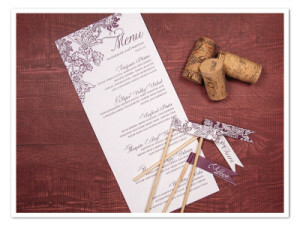 Ideas include stories that each person can fill out one word of, proposal ideas, and even letters on what they think of the wedding. There are plenty of mad lib game ideas so look around and have some fun. 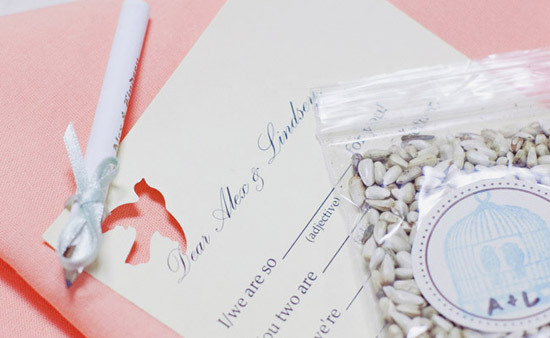 Exit cards are great for anyone who wants to keep cards in their guest book. 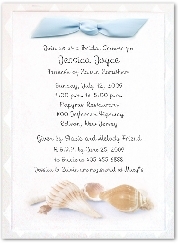 Exit cards should have spaces for the name of the guests leaving and when they left. Other possibilities include their thoughts on the wedding (such as ‘was it’), what they wore to the wedding, or even a short space for well wishes (such as “We wish you a ___________ wedding night”). 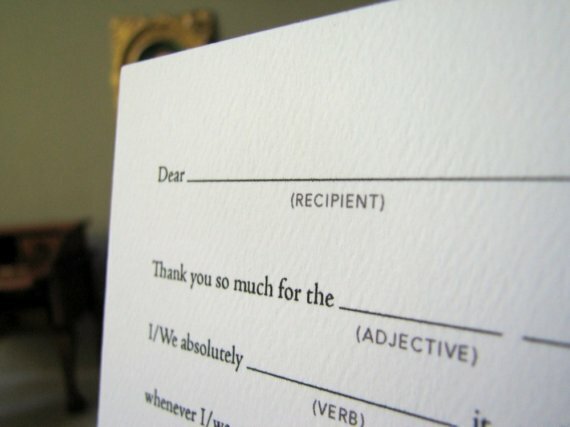 Chances are that sending out thank you cards for gifts is going to be the most unpleasant part of your wedding, just because you have to write so many. Instead of giving yourself carpal tunnel, try printing out mad libs and filling them out with items like ‘Thank you for your _____ gift’. 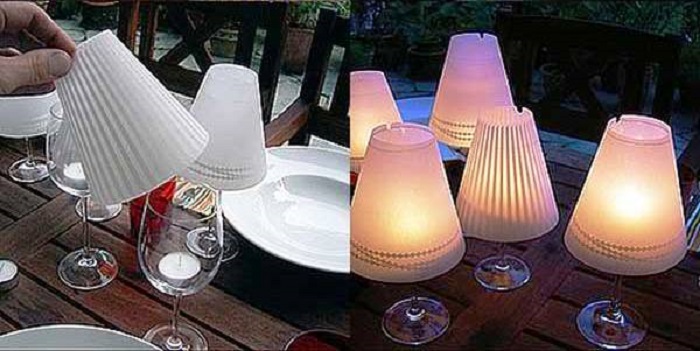 You can add as many spaces as you like to each one so that you can make it more personal if you like. If there is a chance that your guests will be sitting around waiting (such as at the reception), try adding in some time killers for the guests. 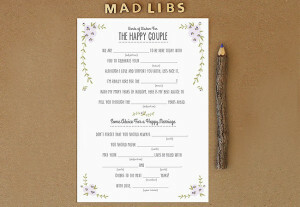 Mad lib ideas such as ‘the couple’s favorite things’, ‘the proposal’, and ‘what will happen at the wedding’ are always entertaining and a lot of laughs both during and after the wedding. 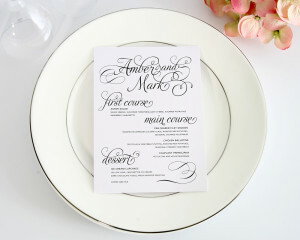 Mad lib wedding menus are a great idea for anyone who wants to give guests a couple of choices for food. Consider handing out sheets with a list of options and let guests creatively fill in the menu to be brought back to the cook. 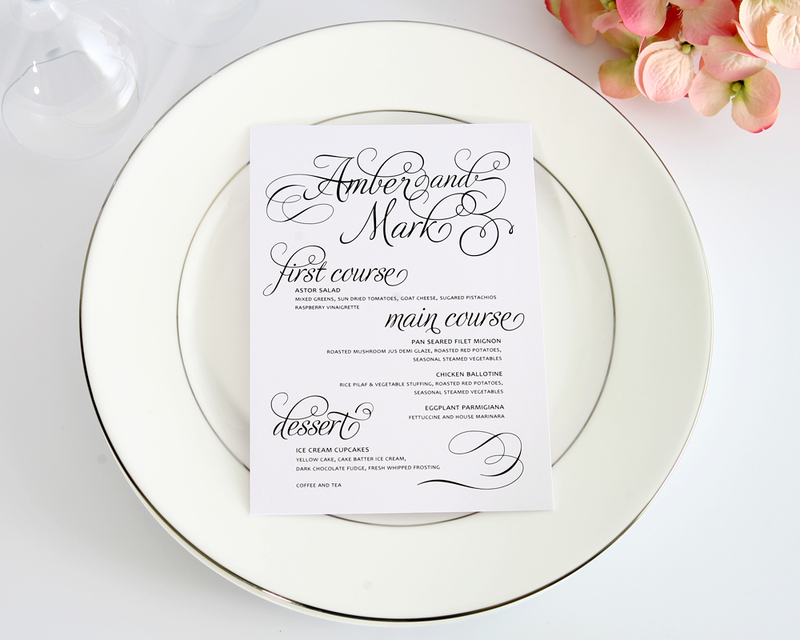 You should of course discuss this with your caterer in advance so that they know what to expect. 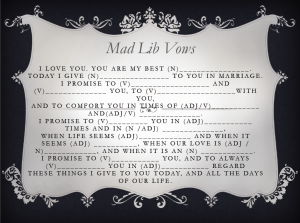 A mad lib storybook is one of the oldest ideas available. While you can go with any sort of story or theme, themes based on the couple are usually the most popular. Consider ‘the proposal’, ‘their relationship’, or even ‘their first year’ as great, romantic story ideas that will most definitely keep everyone laughing. Great options include having each guest fill out their own, and each guest getting just one word. 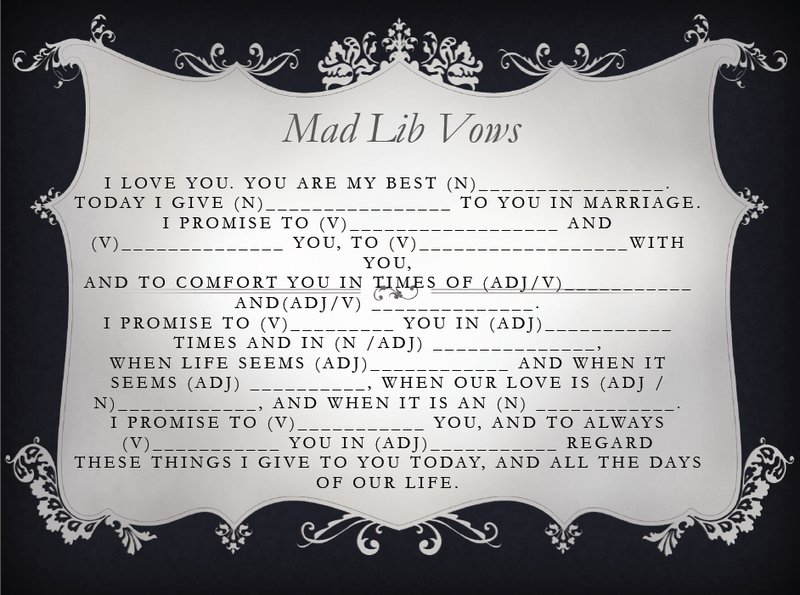 If you are really brave, you can create mad lib wedding vows that each partner can fill out on their own. This is a great way to add a very romantic and sweet touch to the wedding, but depending on the amount of humor involved, it can also make for some less than romantic vows. 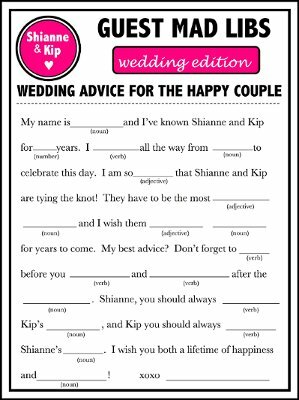 In this case, take a look at standard wedding vows, figure out which words can be replaced, and then print out one in blue and one in pink for the bride and groom to fill out. Usually this is an easier (and more fun) alternative to writing your own vows.